If you have visited Sunnyside Farm you probably entered through the mudroom/laundry room. An odd room with an outside wall inside and a window that had been closed off and the remains stuck up over the washer/dryer. If you visited in the colder months you had the opportunity to feel the wind blow through this room, even with the doors closed. And if you were here on a truly windy day you got to hear and feel the wind blow through this room! 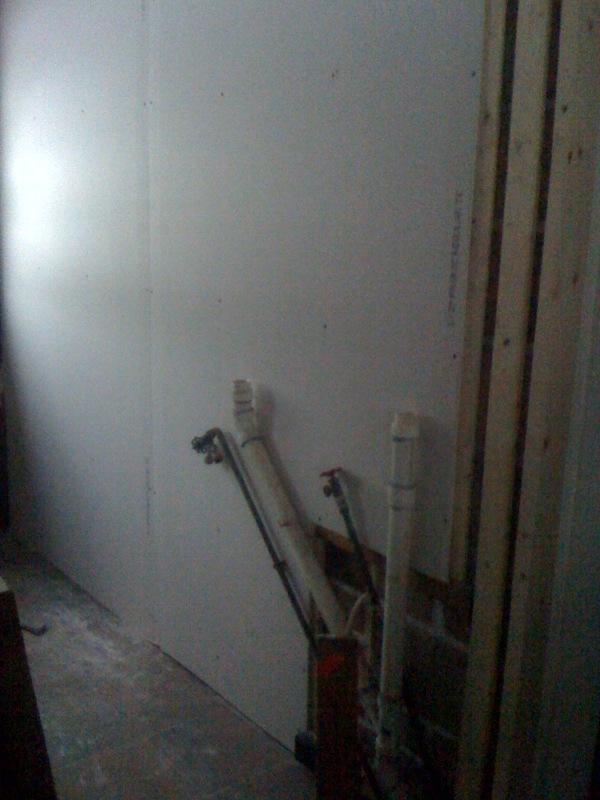 Homer has cleaned up, insulated and dry walled this drafty space. Turns out there was nothing but tar paper between the inside and outside walls. 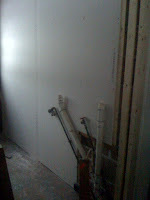 Now there is lots of lofty insulation along with foam in all those little areas known to allow air in. No unwanted drafts anymore! The exterior/interior wall is covered, the rest of the ceiling and walls are now done, with tape and mud to go on this afternoon. And paint will go on next winter, other projects and the farm are calling! Even without paint a 100% improvement.